Kitty Hawk Kites offers kayak tours throughout the Outer Banks. Check out our tours that are north of Kitty Hawk. Paddle the sheltered islands, bays, and canals of Currituck Sound. Typical wildlife seen are snowy egrets, great blue herons, and the occasional river otter. Paddle through the sheltered islands, bays and canals of the Currituck Sound from Corolla and the Sanderling Resort in Duck. Typical wildlife seen in the area includes snowy egrets, great blue herons and the occasional river otter. 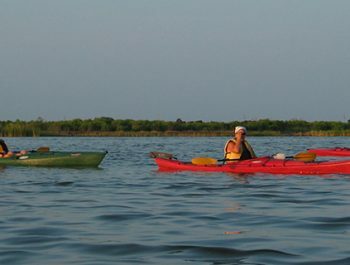 A tranquil setting for nature and wildlife enthusiasts, our Corolla and Duck kayak tours are a relaxing and unique way to experience the lesser-explored areas of the Outer Banks.